Solid core current transformers with 0-2 volt output allow for safe installation. The E 12 P is designed for 120/240 or120/208 voltage inputs. The unit’s 900 MHz Omni-directional spread spectrum, frequency agile transmitter communicates wirelessly to a central receiver via a repeater network on larger sites. 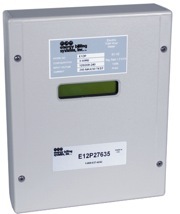 The E 12 P Electric Meter is an outstanding choice for revenue grade metering applications.